You take yourself out of the game, you start talking about puppy dogs and ice cream and of course it's going to end up on the friendship tip. I am a huge fan of L.A. Story but for the most part the detail outweighs any disadvantage. Swingers had a couple good things going for it. The dialog is very funny. While the plot may be a little overdone, the dialog helps keep the situations fresh. The set design helps sell the characters in a way the story and dialog miss. We may not get a feel for how our hero lives until we see him sitting in a pile of his own dirty clothes carving up a sausage with a knife while his friend tells him how much of a mistake his ex-girlfriend made by leaving him. The other side of Swingers is as a monument to the direction styles of Reservoir Dogs is used to follow our heroes into their caravan of cars before they travel into the daring Hollywood nightlife. The DVD for Swingers is pretty lousy. It contains a 1.85 to 1 non 16x9 enhanced transfer that shows a lot of grain and interlace artifacts when blown up on a 16x9 monitor. The sound is Dolby Pro-logic and leaves a lot to be desired for the great musical score. While the movie is generally character and dialog driven, providing a higher quality transfer would have made the whole movie better. It is rare to come across a DVD this bad when even movies like The Mummy are given five star treatments. 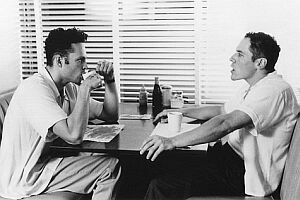 Swingers isn't the end all be all of comedies and wasn't even on the same level as Go. It is quite funny and probably worth a watch, but it isn't going to use your two hour investment as well as many other crafty movies out there. Purchasing the DVD should be avoided like the plague.